Lay a piece of parchment paper over your 13x9 temp-tations Lid-It. In a large mixing bowl combine the oats, nuts, apple pie spice, cinnamon and salt. Stir to combine. Set aside. In another bowl whisk together the brown sugar, applesauce, honey and coconut oil until smooth. Pour over the oat mixture and mix well. 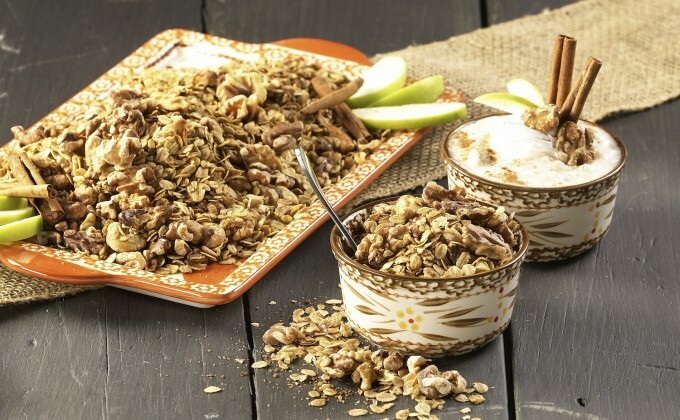 Spread granola evenly on your parchment-lined Lid-It. Bake for 25 - 30 minutes or until golden brown. Stir every 10 minutes to ensure even baking. Cool completely before removing from Lid-It. Store in an airtight container.